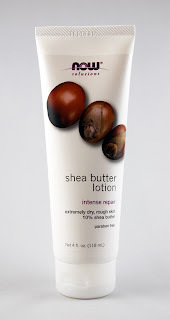 When I hear of shea butter, I think of a thick, hydrating lotion. Now Solution makes a moisturizer with 10% shea butter, and it has a delightful scent: citrus, like citrus candy. This lotion absorbs quickly and leaves skin hydrated. It can be used on patches of rough skin (such as elbows or knees) or as a hand lotion as well. The formula is light enough that it can be used during the day without leaving your hands feeling greasy. I was glad to see that it was gluten-free and many ingredients are plant-derived. However, it contains vitamin A, which weighs down its EWG Skin Deep rating, bringing to a moderate 4. If you're looking for a light, affordable lotion, this one has a fun scent and good performance. Also available on Amazon.com (select 4 oz version).